WASHINGTON (Nov. 14, 2014) -- As the Army draws down its end strength, more Soldiers will be looking for work in the private sector -- some one million over the next 10 years. A kind of corporate mentorship might be one example of how industry could make that transition easier for Service members, said the Army's senior enlisted advisor. "That young Soldier, the first-term Soldier, may not have the skill set you need. But he or she has those intangibles that you are looking for in your organization," said Sgt. Maj. of the Army Raymond F. Chandler III. While speaking to an audience of industry representatives, Nov. 12, 2014, at the U.S. Chamber of Commerce, during a meeting of the Veteran and Military Spouse Employment Advisory Council, Sgt. 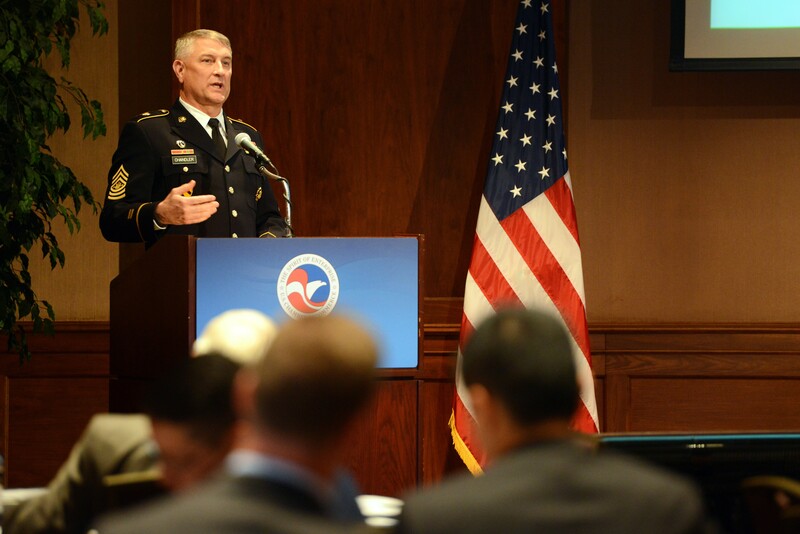 Maj. of the Army Raymond F. Chandler III suggested that a kind of industry mentorship might better help Soldiers find work after they leave the Army. One of those intangibles is leadership ability, Chandler said, while speaking to an audience of industry representatives, Wednesday, at the U.S. Chamber of Commerce, during a meeting of the Veteran and Military Spouse Employment Advisory Council. In order to tap into that market of Soldiers with leadership skills, Chandler said industry might consider a kind of mentorship arrangement with job-seeking Soldiers. "What if you thought about partnering with those individuals and saying, 'I'd like you to use your Post-9/11 G.I. Bill benefit and look for a degree in the information technology field,'" he said. "And in return for that, over a period of two to four years, we'll inculcate our values and beliefs and mission about (our) organization, with a quarterly meeting ... where somebody mentors you in the organization and the corporate life." When the Soldier finally graduates, the company guarantees the new graduate a "quality interview" for a job. Chandler said such companies wouldn't guarantee a job, just a shot at one. A quality interview is "actually sitting down with somebody from human resources and doing an interview -- not just saying that they've received a résumé. They actually have jobs for those skill sets, and that they actually conduct an interview with you for applying for one of those jobs," Chandler said. "If you can get your foot in the door, most kids can sell themselves." Such an arrangement, he said, would solve three problems. First, he said, it might increase use of the Post-9/11 G.I. Bill. Right now, he said, the utilization rate is at about 35 percent. It also provides post-Army Soldiers with "focus and direction -- something they are comfortable with based on their years of service." And finally, he said, it gives a company an opportunity to look at a potential employee to see if "they are really going to fit into your corporate culture and organization." As the Army draws down to 490,000 Soldiers by the end of fiscal year 2015, and goes as low as 420,000 by the end of fiscal year 2019, if full sequestration returns, Chandler said he is concerned most about two types of Soldiers: female Soldiers and first-term Soldiers for whom the Army has been their only job. For female Soldiers leaving the Army, some of whom are single parents, "their unemployment rate is almost three times as high as their similar male counterparts," Chandler said. "How do we help them? How do we provide a soft landing?" Chandler said that inside the Army there has been some discussion about extending some kinds of benefits to help those Soldiers with their transition. For first-term Soldiers who transition to the private sector, he said those Soldiers might be shocked at how the private sector compensates them differently than the Army. He also asked private-sector representatives to consider how they view a first-term Soldier's resume -- and if intangibles such as leadership, ability to operate under stress, and willingness to set aside personal needs are being considered. Finally, he said, the Army cannot get Soldiers hired in private-sector jobs. What it can do is prepare Soldiers for private-sector jobs. Soldiers themselves, with adequate guidance from the Army and their leadership, must prepare themselves for their futures. "Soldiers can help themselves," he said. "That's through getting as much civilian education and credentialing opportunities as they can while on active duty. When a Soldier starts, there should be a plan in place for that individual to start working on college after one year of active federal service." As part of the Army's "Soldier for Life" program, Chandler said the Army starts talking about transition to civilian life with Soldiers "almost from the moment they come into the Army." And with the Army's Transition Assistance Program, Soldiers may start as much as a year in advance of separation or retirement to contemplate their plans for the future. "One year out we are starting to talk to you about what direction you will go," Chandler said. "Do you want to stay in? Do you want to leave? What will you do? That's where leadership comes into play, and the Soldiers have to recognize they have a responsibility to take care of themselves."